Before and after: bone contouring surgery. Photos that have gone viral on the web recently reignited the debate surrounding South Korea's "plastic surgery problem." Posted on Reddit by user ShenTheWise with the caption "Korea's plastic surgery mayhem is finally converging on the same face," the thread has gained more than 3,200 comments. One Japanese blog, in particular, stirred controversy by claiming that South Korean beauty pageants were nothing more than a clone parade. Some commentators have pointed out that the eery similarity of the women in the viral photographs to a large degree can be attributed to the normalizing effects of photoshop. Nonetheless, the occasion of the photographs have ignited a debate about South Korean cosmetic surger practices, especially the more extreme forms. 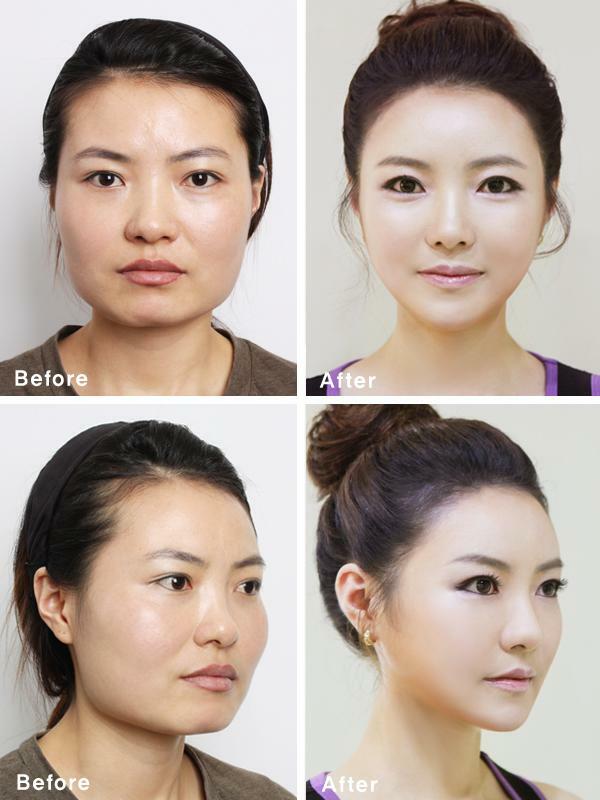 South Korea has the highest rate of cosmetic surgery of any country in the world, with 74 procedures per 10,000 people. Coming in second is Brazil, with 55 PP10K. Taiwan ranks third, with 44 PP10K, and the United States ranks fourth with 42 PP10K. Overall, the highest number of procedures are performed in the United States. Archives like this Tumblr showcase the transformations undergone by individual Korean women and men — but mostly women — who elect to widen eyes, straighten noses, and undergo facial bone contouring surgery. That's right: facial bone contouring surgery. This procedure has proved particularly unsettling, because it involves shaving bone from the face, rather than merely breaking and removing cartilage, as with rhinoplasties and other procedures that, according to some commentators, "still seem rather surface-level." Jawbone reduction surgery involves cutting off a portion of the mandible, or removing the outer cortex of the mandible, to achieve a streamlined "V"-shaped jaw. Cheekbone shaving can make the face look smoother, and contribute to the "V" shape. Because facial aesthetics are affected by the ratio of chin to nose and other features, to achieve balance facial bone contouring surgery is often accompanied by other surgeries, including nose jobs. Following the procedure, patients generally do not eat solid food for a month. Some sources consider this "killing two birds with one stone," because of the accompanying weight-loss. Because one of the possible side effects of bone contouring surgery, which include nothing short of death, individuals considering the surgery might first weigh alternatives. As a less invasive option, those looking to change their jaw shape might consider rollers and face slimming masks. According to one testimonial, their results are not as dramatic. But the procedure certainly isn't as scary, either. This collection of photos of all the Miss Korea 2013 contestants was posted on Reddit.